^ 孔学. "论凌迟之刑的起源及在宋代的发展." 史学月刊 6 (2004): 38-43. ^ Poulet, Jerome Bourgon, Muriel Detrie, Regis. 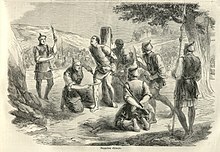 Turandot : Chinese Torture / Supplice chinois. turandot.chineselegalculture.org. [2018-03-25]. ^ 不堪回首 揭秘中國歷史上幾次最著名的凌遲. 新浪. [2018-03-25]. ^ Taylor, John. Body Horror: Photojournalism, Catastrophe and War. Manchester University Press. 1998. ISBN 9780719037221 （英语）. Bourgon, Jérôme. "Abolishing 'Cruel Punishments': A Reappraisal of the Chinese Roots and Long-Term Efficiency of the in Legal Reforms." Modern Asian Studies 37, no. 4（2003）:851-62.